I won't be in Indonesia for the 2014 season so I am dependent on others for the information reported here. Three people have promised to send me occassional reports - thank you Chris, John A and Wilson. Chris is on the FarRail tour but John and Wilson are visiting separately and independently so we could have reports of up to 3 different visits to some major locations. I hope they will also include photos or video clips. More reports from visitors and local enthusiasts are most welcome and I will credit any information received to the sender. Here are a couple of photos from the 2012 season. In case it is not apparent, I'll use (JR) to show my own comments on the reports. Email me with your reports or comments - click this box. A short walk around the corner from Pangka Mill is a small restaurant that Rob & I have used in the past. On the restaurant wall is a photo which goes back a few years. The staff and I enjoyed looking at it again. Visible from left to right are Mark, me, John B, Rod S, Peter G, Peter N, John A and Cliff along with some whose faces I don't remember and the friendly restaurant staff. If you are in this photo let me know. And those who went to Java only once may be able to date it. Which year was this? Read the FarRail Java 2014 tour description and itinerary - click here. I already updated the 2014 milling season reports to Rob Dickinson. He has been in touch with me and has been updating his site with my reports. So you can check out his site, and, you can ask him to forward my photos. I've also sent him photos of reports from Sumberharjo and Olean this year. Just prior to Eid, which is Monday next week, I will be going back to Situbondo to Wringinanom and Panji, and check out what's been happening there. I'll let you, and Rob Dickinson, keep up to date with this year's milling season. You can see my latest photos on my flickr, which is https://www.flickr.com/photos/bad_boy_4_life/. The first few photos are taken very recently, and feel free to have them. Like I said, I already sent them to Rob Dickinson so you can ask him to forward them to you. And secondly, I live in Jember now, got a job at a state owned bank here, so it's just 2 hours down the road on a motorcycle to get to Situbondo, and only 1 hour on a motorcycle to get to Semboro and Jatiroto. (JR) He has a point - Rob has been documenting steam in Java for many years. I've added a link to his page - top right. However, on this page I hope to capture a bit more of the personal side, a bit more of how people interact with the trains, the mills and the workers and daily life in Indonesia. I hope to get out to the fields sometime and if I do I will send some reports. Olean at least has steam out in the fields. Here in West Java the dry season does not seem very dry this year, so that may impact on the harvest and harvesting of the cane. Attached is a pic from a couple of years ago at Sumberhardjo. I always find it a real challenge to make trains of empty lories look interesting (at least in still photos). In this case I spent most of the time trying to avoid those blasted wires getting in the way of my shots…..
(JR) I love this photo and I hope it gives an idea of the unusual Java 2014 milling season posts we could see here. Your contributions are most welcome! My Java DVDs going back to 1982 are here. along with your email address. It's a free service from changedetection.com but you need to sign up for it. Four items below are based on a google search for Java Sugar Mills 2014. For each item, if you click on the box, it should take you to the website referred to for the full details. Indonesia`s annual sugar consumption is estimated at 5 million tonnes, while the country produces only 2.50-2.57 million tonnes of crystal white sugar a year. Therefore, almost 50% of domestic demand, including from the food and beverage industry, is met by importing sugar. The government has set itself a target of achieving sugar self-sufficiency by 2014 to meet the country`s annual need for sugar, amounting to about five million tonnes. PT Gendhis Multi Manis (GMM) has officially started operating a new sugar mill in Blora, Central Java. The mill is touted as among the most modern in the country, with a production capacity of 600 tons of sugar per day. This year, GMM will also build a sugar mill in Madura, East Java, which will have a production capacity four times greater than the Blora sugar mill. "Jokowi said that if he is elected, he will prioritize sugar mill improvement. Up to five sugar mills will be improved each year," he added. I wonder if any of these new or improved mills will have any use for railways? They plan to visit Semboro, Olean, Asembagus, Pagottan, Kanigoro, Purwodadi, Soedhono, Tasik Madu, Ambarawa, Sragi, Sumberharjo & Pangkah so no surprises there apart from the omission of Cepu. Can anyone on the tour send me a report of the trip? The Indonesian Meteorology, Climatology, and Geophysics Agency (Badan Meteorologi, Klimatologi, dan Geofisika, BMKG) reported in January 2014 that twin tropical storms were developing in the eastern part of the Philippines Sea and near Darwin, Australian. Although summer has started in the southern hemisphere, low pressure remains in the eastern Philippines. BMKG expressed concerns that if low pressure continues, it will reduce the prevailing wind pattern flowing from Asia across Indonesia to Australia, leading to another El Nino phenomenon during Indonesia's 2014 dry season. El Nino may reduce sugar cane production by prolonging the dry season and reducing rainfall. Indonesia's 2014 rainy season is still ongoing, with sufficient rainfall. Normally, the rainy season lasts from October to April, while the dry season takes up the remaining months. Sugar mills on Java are expected to start milling by May. The milling period is expected to last longer, possibly stretching into January 2015. The MY 2014/15 milling period is estimated to be shorter than MY 2013/14. A shorter milling period will lead to a higher recovery rate, (7.4 percent in MY 2014/15 compared to 6.8 percent in MY 2013/14). There are 48 sugar mills located on Java, accounting for 63 percent of Indonesian white sugar production in MY 2012/13. The balance is produced by 14 sugar mills outside of Java, primarily in Sumatra. Indonesian sugar mills may increase sugarcane production capacity by adopting new planting patterns, using higher quality varieties, and by better timing harvests to increase recovery rates. 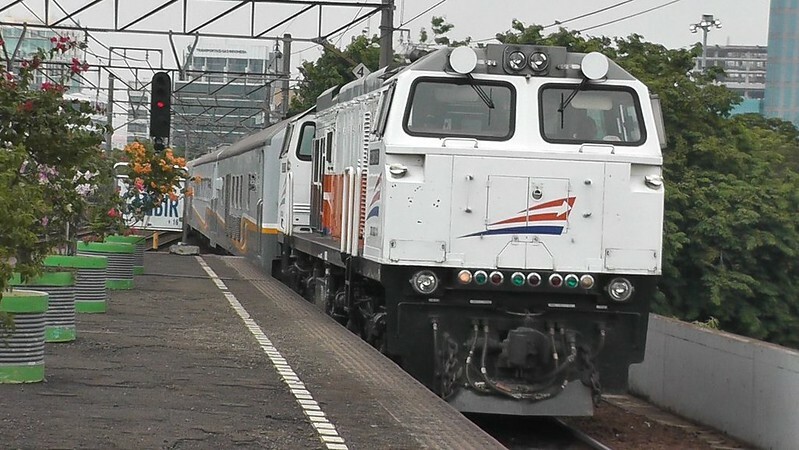 Prior to the start of the FarRail tour, tour participants have been told: "A week ago we were informed that Ambarawa has a) quadrupled the prices for a charter train and b) is not offering the line to Jambu and beyond on the rack section. So we'll "only" experience there the fantastic B51 in service." (JR) I had to look back at my 2012 photos to confirm that we did have a train up to rack to Bedono on the FarRail tour but the 2 photos below prove we did. I wonder if the rack will be available for future visitors? Does Java close down on a Saturday afternoon? Certainly that was the impression I got on the bus from the ferry port at Ketapang to Situbondo. A lot of traffic on the roads but very little seemed to be open and certainly Situbondo was closed for the day when I reached here at four. Bus went past Asembagus and Pandji and managed fleeting glimpses of both. At Asembagus the gates were closed, didn't seem to be any security on them, nobody seen around the place and certainly no queues of road trucks waiting to be unloaded. No truckloads of cane seen on the roads either. Pandji had security on the gates but again gates were closed and no road trucks seen. You can see the rail yard from the road and it appeared to be absolutely chocka with empty rail wagons. You may recall Aditya reckoned they had given up on their rail system. After writing the above Zaenal called round. He confirmed Pandji no longer using rail and said crossing over main road has been sealed over. Olean operating one steamer, we're going there tomorrow, although yard visits no longer possible without permission from Surabaya. This ruling came into effect a couple of weeks ago apparently. Tomorrow is last day of post Ramadan holidays and this is why things seemed so quiet to me. (JR) Some readers may know Wilson's visitor Zaenal as Combo (ace fixer for foreign visitors including gricers to Situbondo - if you don't find him, he will find you!). Wilson, are you staying at the Rosali or the cheaper hotel in town? Don't forget to check out my walk from Situbondo to Wringinanom on the disused Cape Gauge line - see http://www.users.waitrose.com/~jraby/javablog12.html for details. That will quickly get you back into the real Java! Ah, Olean. Definitely one of life's little treasures and certainly able to produce the unexpected. After a two hour wait this morning two very long trains of empties left behind big orange diesels 4 & 5. Thought they must be new as couldn't recall them from two years ago. A short time later a much smaller train headed off hauled by steamer No 4. Thought to myself there's going to be some action at Olean today and asked when 4 & 5 had arrived. Turns out they belong to Wringin Anom and were taking the empties there so it was only No4 in action at Olean. Empties went out to same place they were harvesting when I was last here and loco returned light to the mill. Steamer 4 was supposed to go out again at 3 to collect the fulls but when we arrived at the mill just after two were told it had already gone. Off we went and found orange diesel No3 heading out light so assumed the steamer was running ahead of it. Walked down to the loading point expecting to find two locos but only the diesel there! Some nice shots of buffalo, chased the train back to the mill and by 5 the day was all over. Is diesel 3 a Wringin Anom loco too…..most likely looking at the lists I have with me. Did I enjoy my day? Assuredly and the mix of diesels added to the interest. Small Japanese tour group also here……familiar faces from previous visit with them remembering yours truly as well. No photos possible as Panasonic has decided not to talk to the tablet. Most likely an operator error so will run thru instruction book in room later. (JR) Can anyone comment on Wilson's findings today? Is the link between the two mills open. Are Wringinanom diesels working the Olean lines and what of Wringinanom mill itself? With 3 large (Japanese?) diesels absent from Wringinanom, what is bringing in the loaded trains - or what is happening at Wriginanom mill? - the intermill connection is in use - probably the last one left in use in Java. - Wringinanom Mill may have a problem as these locos would normally be fully employed there. 4 and 5 are Keio 8 and 9 of 1983 according to Ray's list. It indeed sounds as if the link to Wringinanom is open, maybe that mill had a serious breakdown and they sent cane to Olean. They can't afford to let these locos go, they are their staple power. Combo could easily find out. If you don't know where the link is, it's easy to find. Go west from the mill along the road which runs next to the line. It does a dog leg right and then left. Continue until you come to a T junction (about 1km). Ahead are Wringinanom fields. Turn left and the link is the line that runs across the road after some 500 metres or so. Intermills I thought were finished for ever in Java. 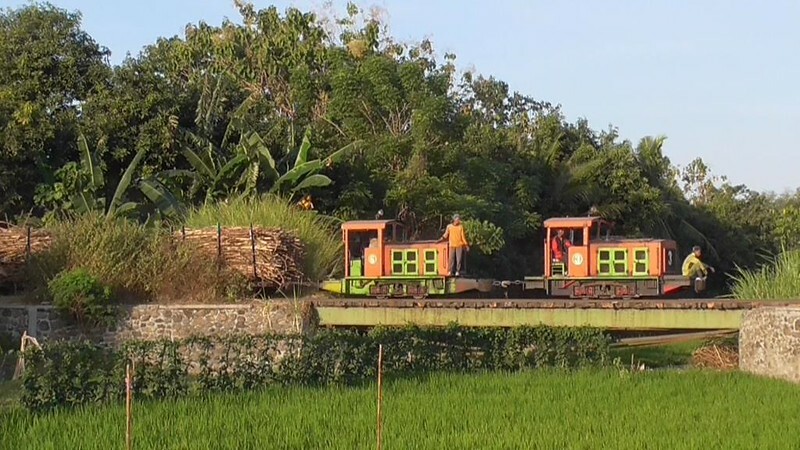 The 700mm gauge Madiun mills were all interconnected in the old days, the links were mainly used when they needed to borrow a loco, I never saw them used for cane transfer but there again I saw very little field working there before it finished. It was always nocturnal unless things went wrong. Operator difficulty with camera and tablet possibly solved. Will attempt a few photos next. Shortly after a very small Olean train headed to same loading point as yesterday. 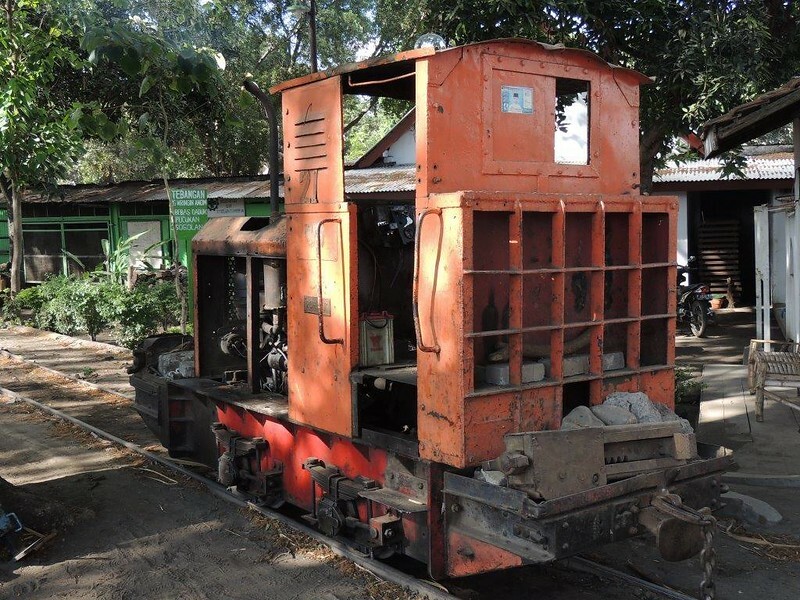 Little diesel loco, orange, no number but with ballast weight front and back consisting of an axle and two wheels. A pleasant morning with Japanese away at Asembagus so no one to get in my way. No Combo either as he was teaching but the 'deputy' was more than able although minimal English. Combo back on deck this arvo. We did the Japanese a favour yesterday and in return were told they had organised steam for this afternoon's train. Mind you they thought that was going to be the situation yesterday too! Anyway we found No3 diesel heading to Gellung and crew advised steam between Tribungan and Karang Malang. No4 again, fully loaded and ready to go with Japanese in attendance. Their guide said there would be a couple of photo runs then train would be 'delayed' until sunset and I was welcome to join in. Offered to contribute but told all fixed and I was most welcome! Who am I to turn down that sort of offer………..
Have decided to spend another day with Combo so Wringinanom and Pradjekan tomorrow so may find out what is going on between the two mills as Combo didn't know when queried this arvo. (JR) For those who are not from the Antipodese, avro = afternoon . Click here to see 8 other pictures taken by Wilson today at Olean. (JR) I note that this loco has detail differences from the Wringinanom No. 3 I photographed in 2012- see above - but could be the same loco. No. 4 is clearly Wringinanom No. 4. Whilst the Rosali prepares food l'm able to get the days report done…a reasonable system I'm finding. At back entrance to Wringin Anom just after 7.30 this morning. 8 also had cab plates proclaiming it to be 21 and named Ruhaak. By 8.00 the field trains were getting underway with two heading south over the big bridge. So on basis of these sightings there must have been no Wringin Anom trains at Olean this morning. Also the Wringin Anom No 3 and No 3 seen at Olean are not the same locos as speculated a couple of days ago. Have not been able to find out why WA's cane was going to Olean. Down to Pradjekan this arvo to find No 3 on molasses train and just completing its last run of the day. Afternoon not wasted though as 4 was taking loads from the yard, across the main road and into the mill whilst 2 was moving empties in the opposite direction. Nothing like a bit of traffic chaos to entertain! Click here to see Wilson's photo album on Flickr. (JR) Photo clearly showing Wringinanom No. 3 is not the same loco as the new No. 3 at Olean. Does anyone know where the Olean loco came from? (JR) Scott Jesser writes to say that No. 3 at Olean is Asembagus No. 3. For more on Olean, Asembagus and Wringinanom, see below. The Japanese No.3 seen recently at Olean is Asembagus No.3, which we saw shunting the mill yard on 25 July 2012 (my shot of it at Asembagus is attached). 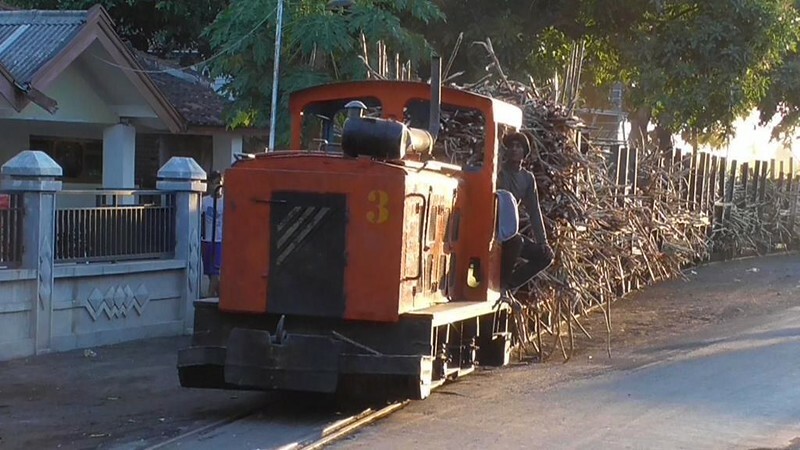 The new No.8 at Wringinanom ("Ruhaak") would be the Baguley 4wDM that was transferred from Kedawung to Wringinanom a few years ago. 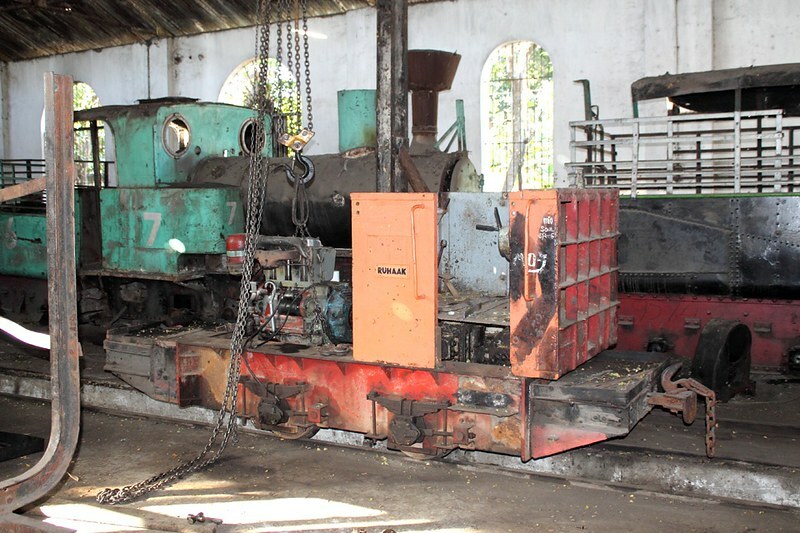 When we saw it on 24 July 2012 it was dismantled in the Wringinanom loco shed (another shot attached). (JR) You can see Scott's photo on No. 8 below. Are there any more working Baguleys on Java? This could be one of Java's rarest diesels! Mark Hambly confirms that this photo was taken in 2010 on his only trip to Java. (JR) Wilson found Wringinanom No. 8 on shunting duties today . 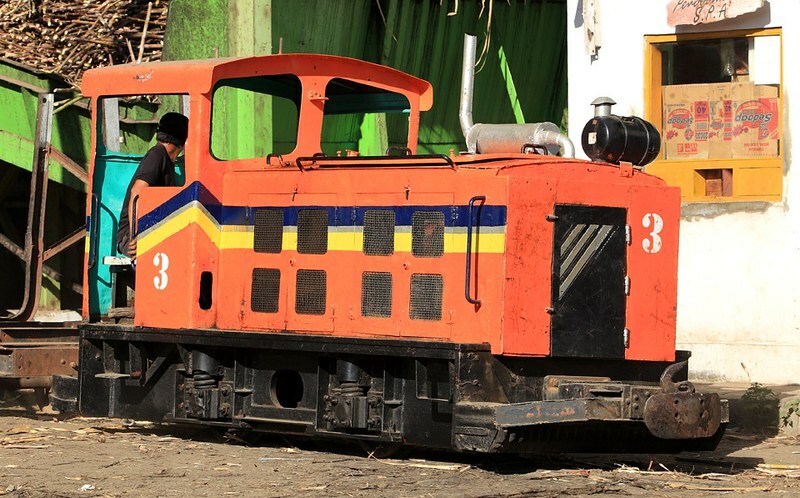 Rob Dickinson covers some of the less common diesels in Indonesia - click for details and scroll down for a photo of this loco No. 21 at Kedawung. Rob writes, 'There were a number of Baguleys sent to Indonesia, most went to Sumatra. However, this 4wDH went to Kedawung in 1950 and was still at work when photographed by Ray Gardiner in the late 1990s. Arif visited Panji on 22-23 June and found the tracks to the fields cut and reports that. Two locos are still used to bring cane from the truck yard loading gantries to the mill yards (Keio No. 9 & No. 10 ) and two more to take the cane from the mill yard to the mill crushing train (Schoema No. 3 & No. 4). Click for photos of these operations and also diesel No. 3and steam No. 4 at Olean. Am slowly covering John's Situbondo Heritage Walk but doubt whether I'll manage it in entirety as already it seems I haven't allowed enough time here. Yesterday I covered from the big bridge to the disused state railway line and today managed from Wringin Anom mill to the big bridge plus a short diversion up each of the two north lines. Started the day with another quick look in the WA yard then headed out for some lineside shots. Five trains of empties headed away within an hour and a half: two for the south line, two onto the first north and one onto the second north. Was going to spend the afternoon at the big bridge but decided it may be more fruitful between the mill and the first junction. Between 2.30 and 5.00 three inbound trains one of which was double headed and two light engine movements so reckon I made the right decision. The double header was not so much a case of two engines being coupled together as being tied together with some iron rope. The morning spent at Pradjekan. Found 3 & 4 by the molasses tanks with 3 on the molasses train and 4 on a short rake of cane wagons. After two molasses trains in quick succession the crossing keepers disappeared, I hung round for a bit but obviously nothing more was going to happen so headed back to Situbondo and a haircut. 10.000IRP…… a lot cheaper than at home but feel too many dark hairs removed with an excess of grey now remaining. Afternoon back to WA for two loaded trains in and two light engines out. Delayed my return to Rosali in the hope of another double header but all that achieved was a walk home! (JR) The first line north leads to the intermill connection to Olean. Click for Wilson's other photos from today. John Athersuch is now in place in Tegal for a visit to Pangkah Mill tomorrow. His report will appear here. Above is his photo of his transport from Jakarta. I was shocked to hear about Pandji closing its field lines. I always wanted to spend more time on that system, but thought I should prioritise other mills which seemed to be under more immediate threat of closure. Pandji always seemed more secure. However, on reflection hold-ups on the road crossings, as in so many other cases, probably did for it. I hope the irony is not lost on those who drive around these areas and are held-up by all the cane trucks clogging the roads! 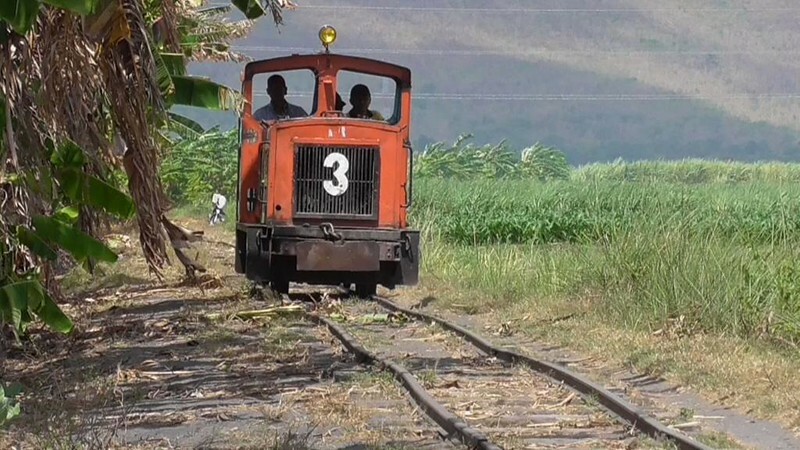 Also run-pasts of cane trucks are not very photogenic, even less photogenic than diesel locos pulling the cane! Incidentally, I wonder whether any field lines survive at Pandji that do not cross the main roads (i.e. to the South and East)? I have not heard any other shocking news from other mills (yet), but there is time. Indeed the rumours of the mill tramway being closed at Sragi seem to have been proved false (at least for this year). The worst news seems to be from the Cape Gauge railways. The rack section at Ambarawa is currently not operational (allegedly being renovated), and quotes for charters on the currently operational flat section to Tuntang have reached simply unbelievable and unpayable amounts of Rupiah. Clearly the railway 'bean counters' have done their sums and realized that the regular railway is cheaper to operate than the rack section. That is almost certainly true, but it seems that whoever is making these decisions knows everything about cost, but nothing about value! I think I may contact the President-elect about this. After all, as mayor of Solo he was instrumental in getting steam back into action there and I helped him source crucial spares to get the C12 operational! Clearly he is a potential uber-gricer! Other bad news concerns Cepu where another bridge problem means that the ride is currently much shorter than usual. The last time this happened the lack of trains resulted in over a third of the track being stolen. It was replaced due to excellent leadership from the then acting President-Director of Perhutani (the State Forestry Company) who was also an enthusiast. She grew up in the forests and became a forest scientist, but never forgot her roots (ouch!) and loved the tramways. She even told me she would like to reinstate some of the lighter rails into the forest, and possibly some of the branches (ouch again!). I am not sure what is happening with the current management, but let's hope that law enforcement is better this time and no track disappears at the dead of night. Still plenty to see across Java though! This part (Part 1) is an introduction and contains reports from Olean, Wringinanom and Pandjie (Panji) and other mills in passing. Click here for Part 5 This final part will summarise the information by mills and also list mills not visited this season and their likely status.